Thirty-one people have been injured after a car bomb exploded at a British army base in West Germany. The device, believed to contain 300lbs (136kg) of explosive, went off close to the officers’ mess at Rheindahlen, 50 miles (80km) from the West German capital Bonn.Twenty-seven West Germans and four Britons were hurt in the bombing at 2230 local time. The force of the blast ripped up the road and caused extensive damage to parked cars and surrounding buildings. Mr Gillies said the fact that it was night-time when the bomb went off and the heavy curtains at the base had helped to protect people. Most of the injured were German officers and their wives, who were enjoying a farewell party at the base. The injured have been taken to the RAF hospital at Wegberg, a few miles south of Rheindahlen, near the Dutch border. The bomb caused parts of the ceiling to collapse and doors were ripped from their frames. A police spokesman said the blast blew out windows in buildings several hundred yards away. Servicemen have been put on alert and police have sealed off the area around the barracks.Public roads run through the middle of the base, which is the Army’s largest in Europe. Service personnel, families and civilian staff make up the community.All vehicles are being checked by soldiers to stop any other attempts to breach security after the bombers drove into the open base. Armed Forces Minister John Stanley said Rheindahlen was on a higher state of security alert than normal at the time of the attack. Mr Stanley said if this had not been the case, casualties would have been much higher. A man speaking in English had telephoned a warning to the German press before the blast, Mr Stanley confirmed. An internal investigation is to be held but Mr Stanley has spoken to MPs about the “immense difficulties” of ensuring total security on such a sprawling base. “different security levels at various parts of the base”. 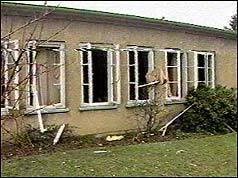 Thirty-one people were injured on 23 March 1987 after a 300 lb (140 kg) car bomb exploded near the visitors officers’ mess at JHQ Rheindahlen military barracks. The Provisional IRA later stated it had carried out the bombing. It was the start of the IRA’s campaign on mainland Europe from the late 1980s to the early 1990s. The bombing was one of several high-profile attacks in mainland Europe by the IRA in the 1980s. It was the first IRA attack in West Germany since a British Army officer, Colonel Mark Coe, was shot dead by an IRA unit outside his home in, Bielefeld, West Germany in February 1980. Coe’s assassination was one of the first high-profile killings by the IRA in Germany and on mainland Europe. A year before in August 1979 the IRA injured four British soldiers in a bomb attack in Brussels, Belgium just one day after the killing of Lord Mountbatten and the Warrenpoint Ambush, which killed 18 British soldiers. In November 1981 the Irish National Liberation Army bombed a British Army base in Herford, West Germany. There were no injuries in the attack. Other than attacks in Northern Ireland & mainland Britain the Provisional IRA also carried out attacks in other countries such as West Germany, Belgium, and the Netherlands, where British soldiers were based. Between 1979 and 1990, eight unarmed soldiers and six civilians died in these attacks, including the British Ambassador to the Netherlands Sir Richard Sykes and his valet, Karel Straub. There was also a mortar attack on British Army base in Germany in 1996. According to author Ed Moloney’s “The Secret History of the IRA”, IRA Chief of Staff Kevin McKenna before the capture of the Eksund (a ship that was to ship heavy weaponry to the IRA from Libya) envisaged a three-pronged offensive that would start in the Northern Ireland and then spread to British targets in mainland Europe. The IRA planted a 300-pound car bomb inside the JHQ Rheindahlen the British Armies military base in West Germany near the officers’ mess. When the large car bomb exploded 31 people was injured, some of them badly. Twenty-seven West Germans and four Britons were hurt in the bombing at 22:30 local time. The force of the blast ripped up the road and caused extensive damage to parked cars and surrounding buildings. The injured were taken to the RAF hospital at Wegberg, a few miles south of Rheindahlen, near the Dutch border. The bomb caused parts of the ceiling to collapse and doors were ripped from their frames. A police spokesman said the blast blew out windows in buildings several hundred yards away. It looked like it was a reasonably successful attack from the IRA’s point of view but the IRA actually had a close escape. The only reason people had not been killed was that the IRA ASU was unable to position the car bomb closer to the mess, because the car park was full of vehicles. Unknown to the IRA unit, most of the vehicles were owned by West German military officers who had been invited to spend a social evening with their British counterparts. Had the IRA’s operation plan been carried out fully many of these German officers could have been killed and the start of the IRA’s Europe campaign would have been a diplomatic and military disaster and a big blow to any of the IRA’s international support. The IRA later said it had carried out the bombing of the Rheindahlen barracks. A statement from the IRA said: “Our unit’s brief was to inflict a devastating blow but was ordered to be careful to avoid civilian casualties.” The National Democratic Front for the Liberation of West Germany, a previously unheard of group, also claimed to have been behind the attack, but this was dismissed by police investigators. More than 12,000 service personnel were stationed at the base. It was the joint headquarters of the British Army of the Rhine and the Royal Air Force. The British Army of the Rhine was renamed British Forces Germany (BFG) in 1994.